Caddies are supposed to be there to help your game not hinder it. Many golfers get nervous the first time they use a caddie. But you shouldn’t. The caddies aren’t watching you on the range to judge how good you are. They’re there to get a better understanding of the distance your clubs fly, key information that will help them give you good advice during the round. This check list of do’s and don’ts should help caddie newbies feel more at ease and enjoy the whole experience. DON’T: Forget to empty your bag of excess stuff (balls, tees, etc.) before the round. Most golfers stuff way too much. Do your caddie a favor and lighten the load. DO: Remember their names. This might sound obvious but many golfers have been caught out. You will find yourself conversing as you go around and names can be useful for that! DON’T: Treat your caddie like a servant or act demanding of them. If you are friendly, they will reward you with loyal service. DO: Almost always let the caddie handle the flagstick. Handling the flagstick is a caddie’s domain. Don’t mess with it. DON’T: Force the caddie to read every putt. Good caddies will only read the putt if asked. Only ask for help if it’s a key putt or a tricky putt. DO: Talk during the walk. Caddies hate the silent treatment. DON’T: Be shy about telling your caddie to quit talking or to remind them not to offer swing advice. Nobody likes a know-it-all, telling you how you should play golf. DO: Listen to instructions on the tee. Any good caddie will get up on the tee box and tell the foursome where to aim. Listen up the first time, so they don’t have to repeat themselves again and again. 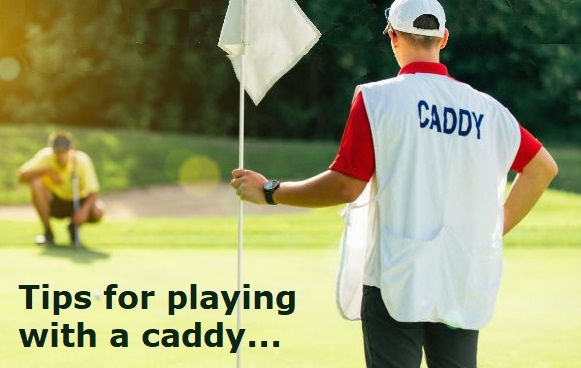 DON’T: Blame your caddie for a bad shot/missed putt. Caddies are used to taking abuse if their player does something wrong. Just don’t be the guy who’s a jerk about it. DO: Let them know what you’re looking for. Some caddies will try and do everything – give lessons, pull clubs, read every putt. Others will just carry your bag. Try to find what works best for you and then lead them that way. Making that clear early on helps set some ground rules! DON’T: Require your caddie to put his/her life on the line for a lost ball. If you don’t feel safe looking for a lost ball, then you shouldn’t expect your caddie to risk his or her safety, either. DO: Allow the caddie to drive or ride on the back of your cart. Most forecaddies will want to ride on the back of your cart on holes with long distances between tees and greens. Caddies are also quite useful driving the cart if you want to walk parts of the course. DON’T: Worry about how you are playing. Don’t throw clubs or throw a mini-tantrum if you are stinking up the joint. Smile and laugh it off. Your caddie has seen worse players. Have a good time! DO: Offer to buy the caddie a drink and/or snack during the round. Caddies spend more than four hours serving you. Any human would get thirsty (or hungry) during that time frame. It’s only polite to offer to purchase something for them. DON’T: Ask the caddie to hit a shot. Many caddies are good sticks, but don’t ask them to show you. Most just want to finish the round and head home. Plus, they could get in trouble. DO: Recommend your caddie to friends. Caddies only get paid if they loop. The more loops, the better. If you like your caddie, recommend them to your friends. DON’T: Ask the caddie what you should tip them. It’s an awkward situation for both you and the caddie if you ask about tipping expectations. The best policy is to find out beforehand. DO: Get advice. They know the course – use that to your advantage. They will not just give yardages but also advice on different ways to play the hole, things to watch out for, lines to go for. Most importantly, just be yourself! Don’t play or act any differently just because you’re using a caddie.